Lainey Hollingsworth has spent her whole life on the outside of a secret. Her mother would never discuss the reasons she abandoned Italy when Lainey was a new born, nor has she ever stayed in touch with the family she left behind. Now Lainey’s mother is dead, taking the secret with her, and leaving Lainey free to find out about her roots. Her husband, Tom, appears supportive, until he hits her with a bombshell that shatters the very foundations of their marriage. Another secret Lainey never knew anything about. Shaken, but more determined than ever to find out who she really is, Lainey takes her children to Umbria in search of answers. What she finds in the sleepy, sunbaked village of her birth turns her world inside out. 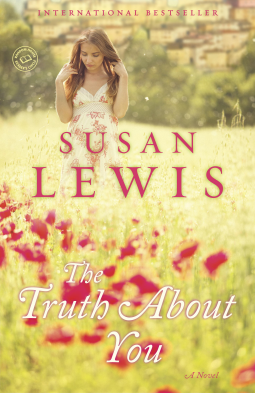 I’ve read several of Susan Lewis’ books over the years (and have to admit to having a few as yet unread ones on my shelf) and one thing I’ve noticed is that they seem to have morphed from being somewhat racy and quite glitzy reads to stories covering more sedate and contemporary family issues. Lainey Hollingsworth is one of life’s dependable ‘copers’. She manages the lives of those around her – her author husband Tom, together with that of their two children, 15 year old daughter Tierney and younger son Zav with almost military precision. In addition, they have Max, from Tom’s previous marriage (a 21 year old but with the temper tantrums of a teenager) and Lainey’s ageing father Peter, suffering from Alzheimer’s, living with them. Lainey is keen to know more about her roots. She has never really got on with her mother and now that she has gone she seeks resolution to some unanswered questions. Her Italian mother Allesandra came to England when Lainey was a baby and had always refused to discuss her earlier life in Italy – Lainey doesn’t even know who her real father was. Peter adopted her when he married Allesandra. In the hope of finding out more, she has booked a villa for a family holiday in her late mother’s home town in Italy and is hoping to find out any information about her Italian family. These plans however are thrown into jeopardy when she suddenly discovers secrets that her husband has apparently been hiding and she begins to question whether she actually knows the person she has been married to for 16 years. Add into the mix a hormonal teenage daughter, a storyline concerning internet grooming and a stepson with his own resentment issues and Lainey’s life is about to become very difficult indeed. I was quickly drawn into the story and into the lives of the characters. They were all very well written and believable – so believable in fact that at first I thoroughly disliked the two eldest children who I thought were quite obnoxious (I’m sure I was never that awful at that age). Lainey was the character I engaged with the most and who I felt the most sympathy for. Her husband and family are her whole life and I could empathise with her fears that her marriage and family were falling apart. The descriptions of the Italian landscape were very atmospheric– so much so, that I wished that I were there too. There were a lot of characters in the book, particularly when the villa owners and their Italian families were introduced and initially it did take some effort to keep track of who was related to who. Lainey’s love and concern for her adopted father, Peter, shone out throughout the book. His deterioration due to the dreadful illness of Alzheimer’s was very sensitively dealt with. My only minor disappointment would be that the story seemed to flag a little in the middle and I started to lose interest, although not enough to make me stop reading. The pace of the storyline did pick up again and although I found the ending perhaps a little too sugary, I suppose it was appropriate. Maybe I have just read too many books or perhaps it was obvious, but I did correctly guess what the developing story involving Tom was going to be together with the secret from the past that Lainey’s mother wanted to keep hidden. Would I recommend this book? Yes, if you enjoy family dramas then you would probably enjoy this. All in all, it was a very enjoyable read. I really should get round to reading more of the earlier books by Susan Lewis on my shelf! My thanks to Netgalley and the publisher Random House/Ballantine for the digital copy to review. I haven't read any Susan Lewis books yet. Looks like I may have to add this author to my list of 'try new authors'.